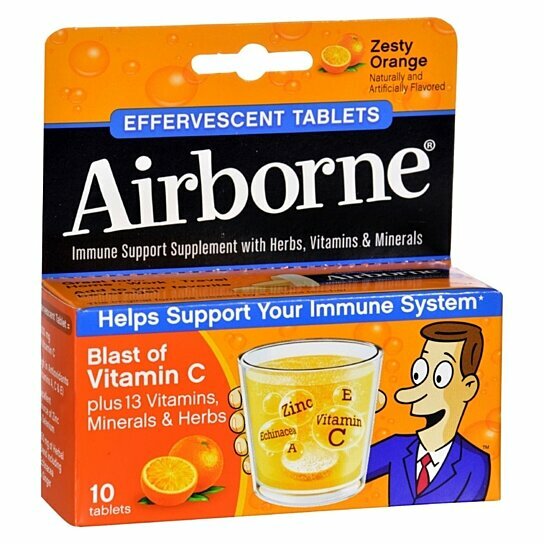 Contains a blend of vitamins, minerals, and herbs specifically formulated to support immune health available in four refreshing fruity flavors effervescent tablets easily dissolve in hot or cold water airborne effervescent tablets deliver real immune support in a fizzy tablet that dissolves in cold or hot water.A unique combination of 14 vitamins, minerals, and herbs, this powerful formula is trusted by many people.Refreshing lemon lime flavor and invigorating fizz make an enjoyable drink.Vitamins, minerals, and herbal extracts provide immune support the key ingredients in airborne effervescent tablets support immune health.The blend of herbs works together with carefully selected vitamins and minerals to support your immune system. * regular exercise, a balanced diet, and plenty of sleep are essential to good health.Vitamins work to help your immune system airborne effervescent tablets are packed with key vitamins to help support your immune health.In each tablet, you'll get 1,000 milligrams of vitamin c and high quantities of other antioxidants.Vitamin c is an antioxidant that goes to work on a cellular level to adjust high levels of stress hormones and enhance the function of immune cells throughout your body.Vitamin e inactivates free radicals that can harm cells.Vitamin a, a phytonutrient that works as an antioxidant, promotes immune health and protects dna.Excellent source of zinc, selenium, and manganese minerals in airborne effervescent tablets have been selected to help support your immune system.Zinc works as a trigger for over 200 different enzymes, which perform a range of tasks like building dna or aiding vitamin a absorption.Other minerals in airborne that support immunity include selenium, manganese, and magnesium.Contains echinacea and herbs extracted from whole plant materials each serving of airborne contains 350 milligrams of an herbal blend.The airborne formula contains echinacea, as well as these herbal ingredients: lonicera, forsythia, schizonepeta, ginger, chinese vitex, and isatis.Glutamine and lysine, the two amino acids in airborne, support immune health.The herbal extracts in airborne are derived from whole plant materials.Effervescent tablet in refreshing flavors drop one airborne effervescent tablet into cold or hot water, let it dissolve, and enjoy the invigorating fizzy flavor.No gluten or preservatives airborne products are gluten free.What's in the box: airborne immune support supplement with vitamin c, effervescent tablets, 10 count. * these statements have not been evaluated by the food and drug administration.These products are not intended to diagnose, treat, cure or prevent disease.